What is the FileMaker Data API? FileMaker Server 17 now offers REST access to your FileMaker databases. There’s more about that how this impacts PHP developers here. The bottom line is that to use REST as part of your PHP solution, you would usually need to write a series of cURL functions and you would have to manually manage connecting & disconnecting from your server, and saving your tokens. We know it’s a pain, because we cut our teeth rolling REST functionality into soSIMPLE Calendar. Simplifies & manages PHP connections to FileMaker 17’s REST-based Data API. 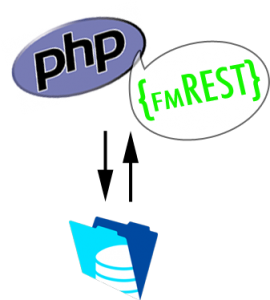 We created this class file to make it easier to manage dynamic REST sessions for soSIMPLE and our custom development. The goal of the class file was to help PHP developers start using the new REST engine as quickly and easily as possible. We’ll also be updating it with new features. If you’d like to add something to it, please let us know. Makes every REST call available as a PHP function. You can download the fmREST class file here. Install the class file by putting the file “fmREST.php” at the same location as your custom PHP page, or anywhere in your include path. And don’t forget to set the extended privilege for your FileMaker file. fmREST will automatically log in for you as necessary, as each function is called. Important note: since we use a cookie to keep track of your token, your first function, or a specific call to the login function should be called before any visible content on the page. The functions that are part of this class use the same name and the same construct as the Data API. The only substantial difference is that you can pass the parameters as either JSON strings, or as PHP arrays. We find that native PHP arrays have been the easiest method. We use the user name and password from when you instantiated the class. This is the only function that doesn’t take parameters the same way as the API Doc. You don’t need to call this explicitly. It will be called whenever any data function is called. Whether explicitly called, or part of another function, the login should happen before any content is shown on the page. We don’t log out automatically when functions are called. Doing so would add to the overhead of every call, defeating the purpose of managing tokens. FileMaker Server will automatically disconnect you after 15 minutes, or you can call this function to manually disconnect the session. scripts can be set to run during specific parts of each routine. See API docs for more details. you can have any number of requests be part of a query by adding elements to the $query variable. you can also add sort, offset, range and portal by adding these parameters to the $criteria variable. please note how the request data is an array of fields, which is wrapped within another array, then wrapped into another array before it’s sent to the findRecords function. By setting a variable $debug anywhere on your page to $debug=true, the class file will output an array object of the data being generated for debugging purposes.